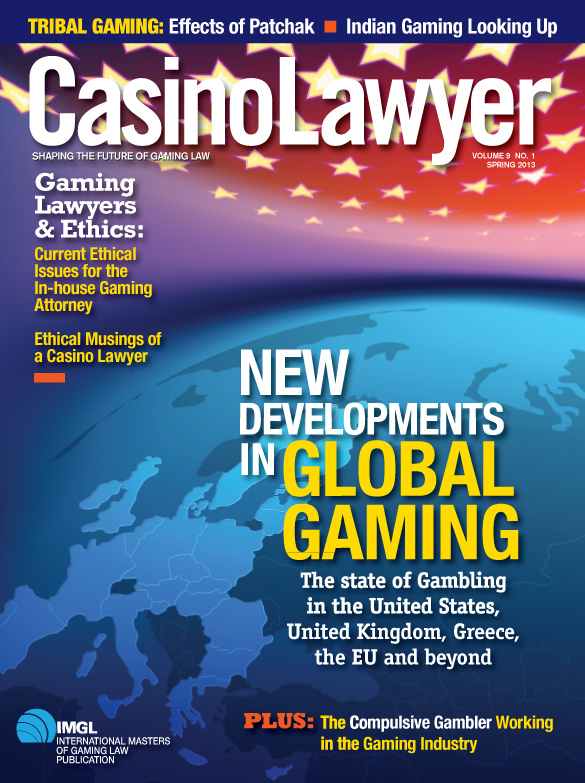 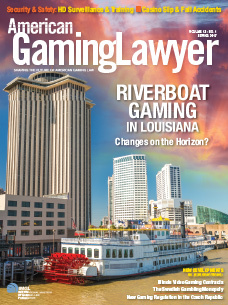 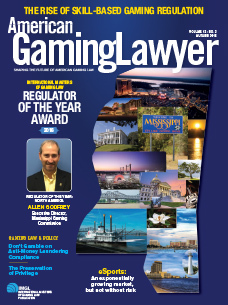 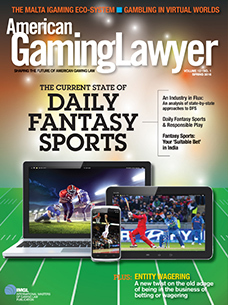 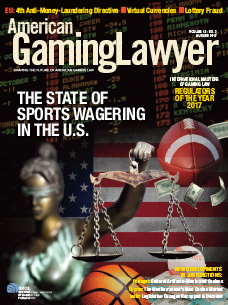 American Gaming Lawyer (formerly Casino Lawyer) is published each spring and autumn by the International Masters of Gaming Law. 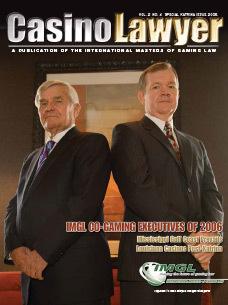 It is IMGL’s first magazine and it has global outreach. 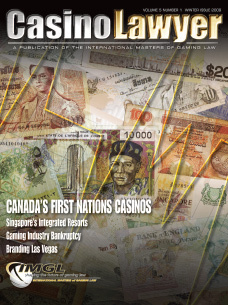 It is read by more than 10,000 print subscribers in North America and beyond, as well as by thousands more who read it online at the IMGL Web Site. 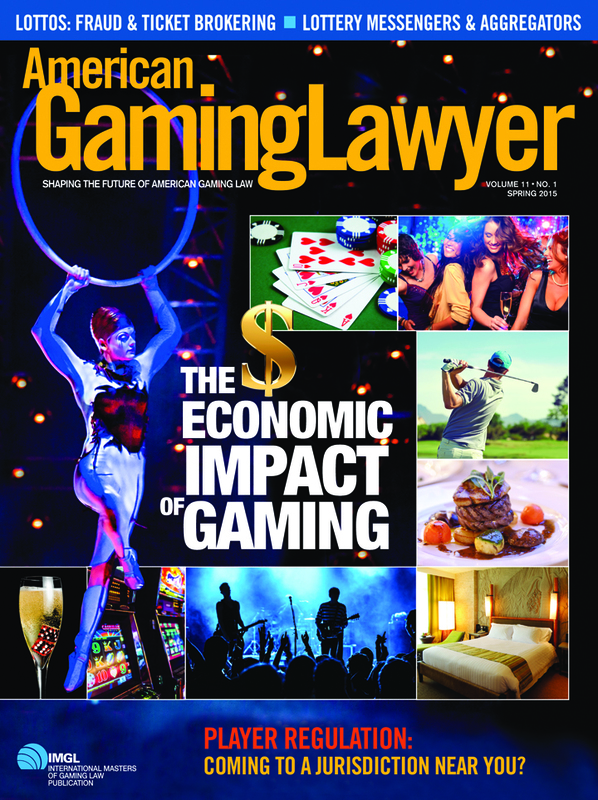 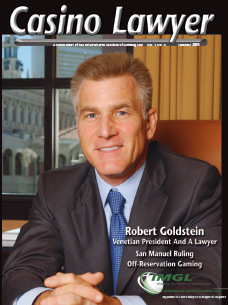 American Gaming Lawyer has bonus trade show distribution at ICE, GiGSE, iGNA, G2E Asia, IMGL Spring and Autumn Conferences, G2E in addition to other global gaming conferences. 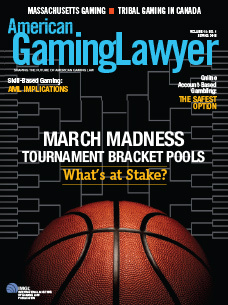 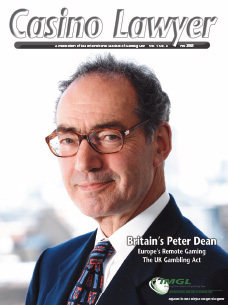 Mailed to all IMGL members, targeted subscribers of Global Gaming Business magazine and by request. 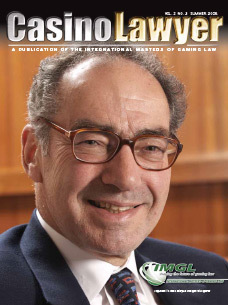 Articles for the Autumn 2018 issue are due by June 22. 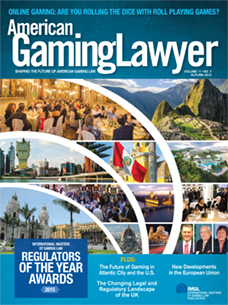 Deadline to submit articles for the Spring Issue is January 17, 2018. 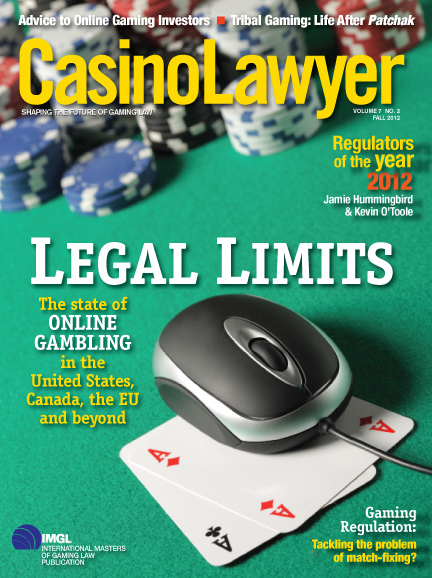 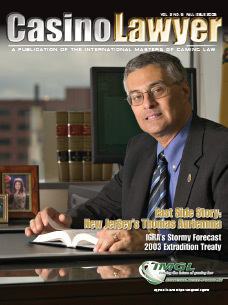 The Malta iGaming Eco-System by Roger A. Strickland Jr.
Indian Gaming Supplies Stabilized Growth to Gaming Industry By Alan P. Meister, Ph.D.
​Impact of the Economy on Indian Gaming vs. Impact of Indian Gaming on the Economy By Alan P. Meister, Ph.D.
Casino Lawyer is published each spring and autumn by the International Masters of Gaming Law. 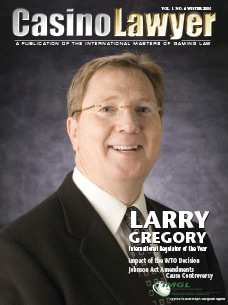 It is IMGL’s first magazine and it has global outreach. 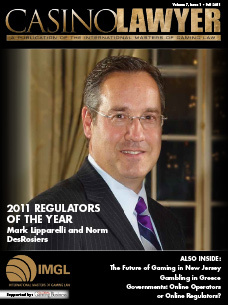 It is read by more than 10,000 print subscribers in North America and beyond, as well as by thousands more who read it online at the IMGL Web Site. 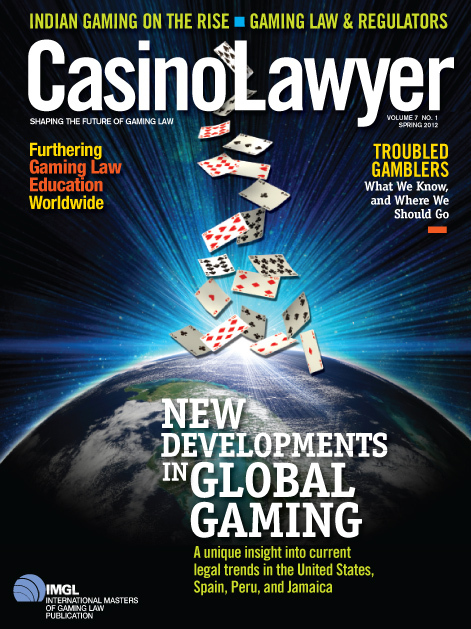 Casino Lawyer has bonus trade show distribution at ICE, GiGSE, iGNA, G2E Asia, IMGL Spring and Autumn Conferences, G2E in addition to other global gaming conferences. 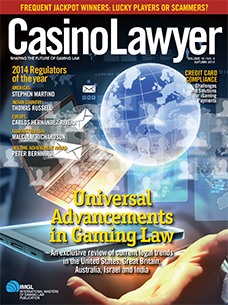 ​Submit articles (that have not previously been published) to Editor Sue McNabb at [email protected]. 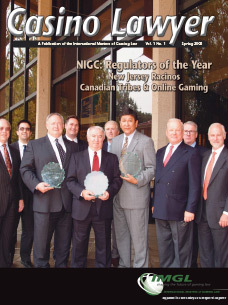 Indian Gaming Outpaced by Commercial Casino and Racino Segments By Alan P. Meister, Ph.D.
​Indian Gaming Looking Up By Alan P. Meister, Ph.D.
Casino In Greece: Where the Games Began By William Thompson, Ph.D.
iGaming Developments in the Northeast By Patrick Madamba, Jr. 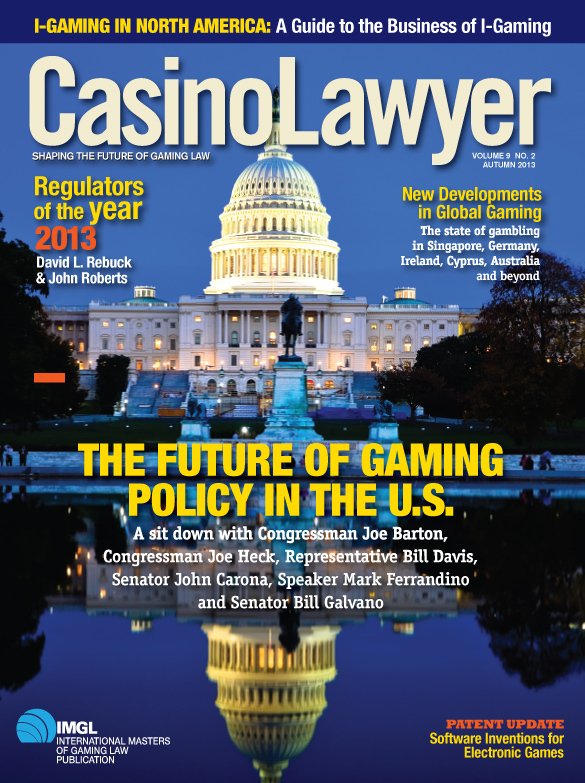 Playing Your Cards Right in the Changing U.S. Online Gaming Market By David J. Apfel and Robert M. Crawford, Jr.
Impacts Of The Structure Of The Casino Industry By William N. Thompson, Ph.D.
Gaming Developments in the Northeast By Nicholas Casiello, Jr., Marie Jiacopello Jones, and Patrick Madamba, Jr.
Indian Gaming on the Rise Again… But Not Everywhere or For All Tribes By Alan P. Meister, Ph.D.
Jamaica: The Legalization of Resort Style Casino Gaming By Nicholas Casiello, Jr. and Patrick Madamba, Jr.
Troubled Gamblers: What We Know, and Where We Should Go By William N. Thompson, Ph.D.
Casino Lawyer (now American Gaming Lawyer) is published quarterly by the International Masters of Gaming Law. 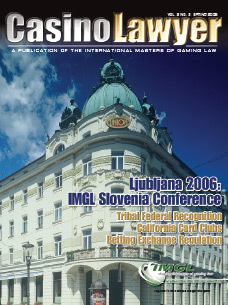 It is IMGL’s first magazine and it has global outreach. 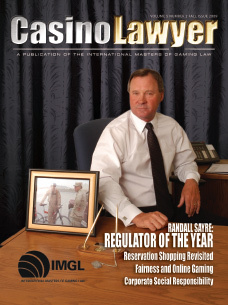 It is read by more than 10,000 print subscribers in North America and beyond, as well as by thousands more who read it online at the IMGL Web Site. 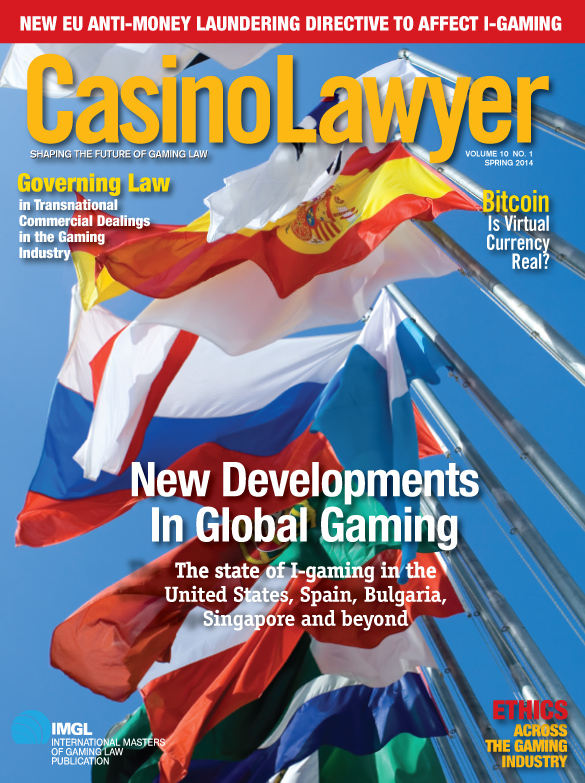 Casino Lawyer has bonus trade show distribution at ICE, GiGSE, iGNA, G2E Asia, IMGL Spring and Autumn Conferences, G2E in addition to other global gaming conferences.